Meghan Markle, on more than one occasion has channeled Princess Diana and taken inspiration from her outfits. Meghan Markle is unapologetically herself and while we love that about the mom-to-be, it has not gone down too well with certain members of the Royal family. It will be a year on May 19, Prince Harry and Meghan Markle's wedding anniversary, since the Duchess of Sussex officially stepped into the royal role. Since then, the former Suits actress has pushed the boundaries for many royal protocols. A crusader of women's rights, an actress and engaging largely in humanitarian work now, it won't be untrue if we say that Meghan Markle does bear some striking similarities to Princess Diana. Princess Diana was a breath of fresh air when she entered her royal role. Not only did she take up charitable causes but went all out and did the best she could to fight the AIDS stigma and looking after children. She was activism-focused and her approach to charity drew attention like no other. Meghan, too, has been vocal about her opinions on feminism, gender equality and social justice. Along with Prince Harry, the couple support many foundations that uplift the under privileged. Princess Diana shocked public and members of the royal family when she hugged and shook hands with the common masses or patients. One of the most significant newsworthy event was when Diana shook hands with AIDS patients. Meghan and Harry too do not shy away from giving hugs to fans, However, Princess Diana was the original queen of hugs. A former royal butler once even told E! 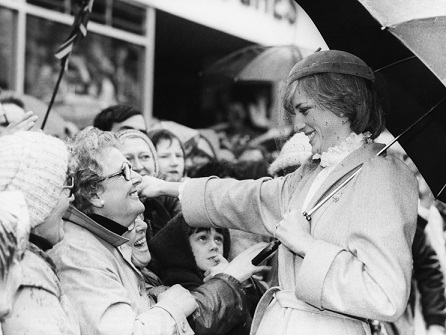 News that Meghan reminds him, and the people at Buckingham Palace, of Diana in her willingness to engage with people and embrace them, like Diana famously did. Meghan's acceptance into the royal family was off to a shaky start given her divorcee status. Then came in the acting background. Whereas for Diana it was her young age and relationship with Prince Charles. To add on to it was the tension with Queen Elizabeth II. They both became a part of the royal family under intense media spotlight which dug up their past including not so pleasant pictures. In Meghan's case, her relationship with her estranged dad continues to make headlines. Meghan and the late Diana seem to have a similar taste in fashion. 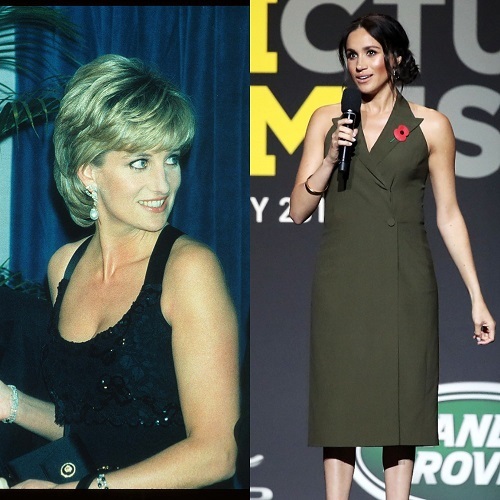 Meghan, on more than one occasion has channeled Diana and taken inspiration from her outfits. 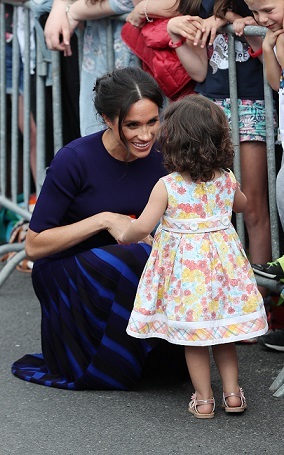 Not just that, Meghan wears skirts above the knee, does not wear stockings, and does not shy away from showing off her shoulders just like Princess Diana. Subtle and elegant yet fashion forward define Meghan's sartorial choices. Whereas for Diana, she was just as rebellious. Like Meghan she never stuck to British designers and experimented with designers and local designers from all over the world. 5. A mole at the same spot? 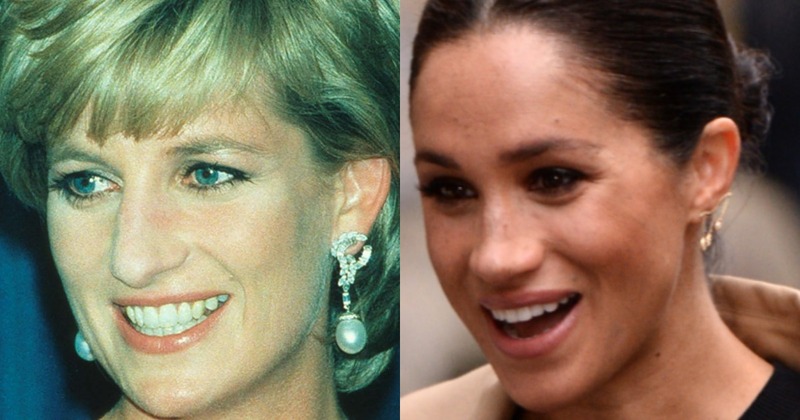 Did you know Meghan Markle and Princess Diana have a similar kind of mole above the lip? Well, it hasn't gone unnoticed and royal fans have been stunned since it was pointed out by some international reports last year.